Sat, Jan. 21 – Banquet Honoring Very Rev. 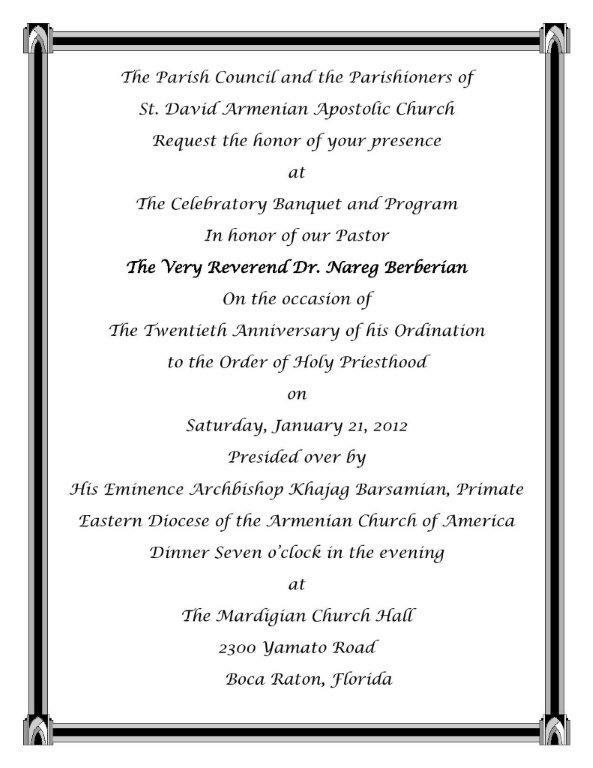 Dr. Nareg Berberian’s 20th Anniversary of Ordination to the Holy Priesthood – 7:00 PM. Fri-Sat, Jan. 26-27 – ACYOA Annual Camping Retreat, Quiet Waters Park, Deerfield Beach. Sat, Feb. 11 – Women’s Guild Cupid Capers Fun Night (Live Music) – 8:00 PM – ? Requiem Prayer at the Khatchkar-Memorial – 10:30 AM. Please call Fr. Vartan for Requiem request by Jan. 6th. Fri, Jan. 13 – Feast of the Naming of our Lord JESUS CHRIST. Sat, Jan. 14 – The Birth of St. John the Forerunner. The Very Rev. Fr. Simeon Odabashian will celebrate the first Badarak of the season on Sunday, January 15, 2012 at St. Mary’s Episcopal Church in Bonita Springs, Florida. Service will begin promptly at 1:00 pm. Advanced reservations for a luleh kebab luncheon (advanced reservations only) will follow Badarak. The next Badarak service will be held on Sunday, February 26, 2012 at 1:00 pm. For further information or to be placed on our mailing list, please contact Parish Council Chair Carole Meghreblian at 239-348-3804. Posted on January 2, 2012, in Armenian Church, Events, General Update, News and tagged Armenian Church, Community, Events. Bookmark the permalink. Leave a comment.